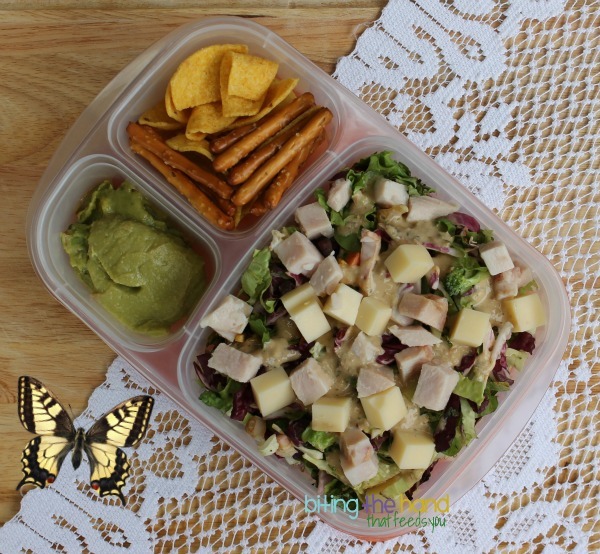 Biting The Hand That Feeds You: Leftovers to Lunch - Chef Salad! 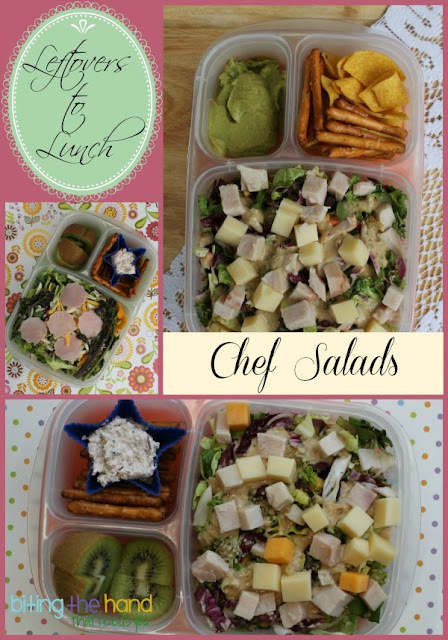 Leftovers to Lunch - Chef Salad! 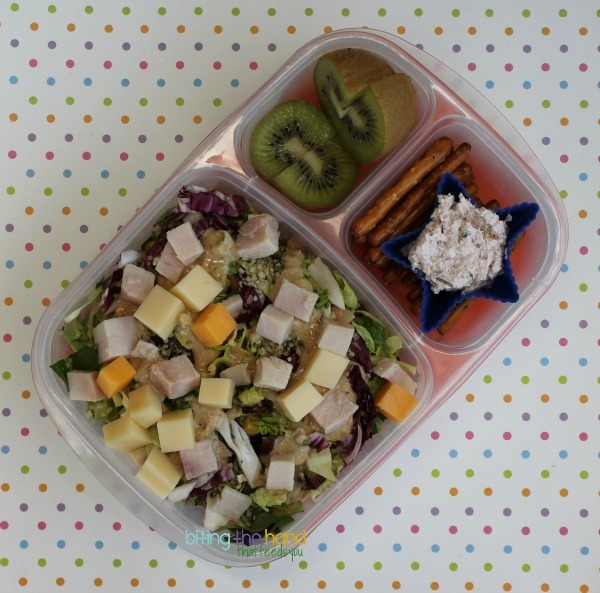 Whether you have some leftover chicken (or turkey) breast or ham, leftover shredded cheese from nachos or Taco Night, or deli meat and cheese scraps from making Cracker Stackers or other cute bento shapes, a Chef Salad is a great way to use them up! Even if you're eating them the very next day, adding them to a salad turns them into something completely different, so your lunch doesn't feel like the same thing you just ate! 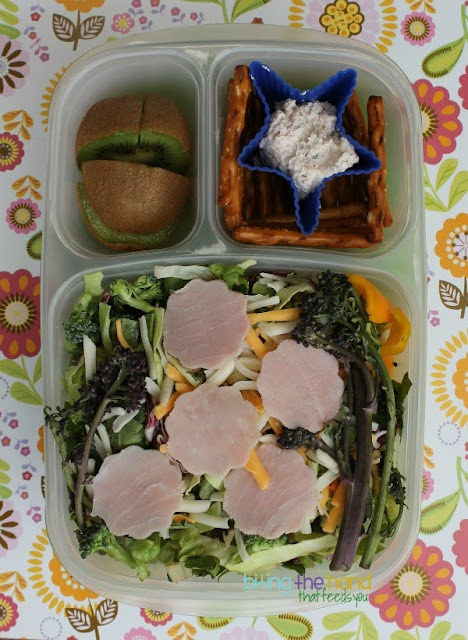 Thursday, 5/9/13 - I still had some flowery ham cut-outs left over from the Family Night potluck at E's preschool, so decided to try incorporating them into a salad to use them up before they went bad. Since I still had plenty of Pink Dip left from making wraps for our Teacher Appreciation lunches, I packed some in a silicone star cup to separate it from the pretzels for dipping. I used green garlic instead of regular, which has a stronger flavor raw, apparently. And one garlic scape is much larger than one clove, but I had thought it had a milder flavor so used 2 or 3 scapes, which ended in a much bigger garlic punch in the mouth! It was great with the ham in the wraps (if you like garlic,) but neither girl liked it. So it was up to Mama to finish it off! Friday, 5/10/13 - Normally we find a local gluten-free restaurant for lunch after Z's OT appointment, but I think we were headed to Nana's this day, so I packed lunches for everyone. It's an hour drive, so no time to waste stopping for food! Monday, 5/13/13 - Since I already had the leftover chunks of turkey and Swiss out for the girls' lunches, I decided to go for another Chef Salad for myself. I also had left over guacamole from the Teacher Appreciation lunches to use up, and decided to change things up by adding Trader Joe's organic corn dippers to the pretzels for dipping. I'm a rebel like that. I was not a fan of either. My store only had "lite" versions of both, and while the raspberry was tastier than Trader Joe's version, it was still not anywhere near Marie's in yumminess. And the Goddess dressing was just nasty. It was thick and clotted looking, and spread much worse than Ranch dressing. And I wasn't a fan of the flavor either. But the consistency was the big turn-off for me. If it were organic and had healthy versions of each ingredient, I could stand the flavor. But pouring it out of the bottle was like pouring really old milk out into the sink. It's hard to enjoy your lunch when you have to fight not to gag while making it! Blech!